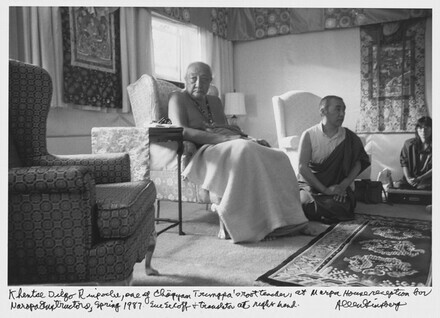 Home » Collection » Khyentse Dilgo Rinpoche, one of Chögyam Trungpa's root teacher, at Marpa House reception for Naropa Instructors, Spring 1987. Sue Secoff + translator at right hand. Khyentse Dilgo Rinpoche, one of Chögyam Trungpa's root teacher, at Marpa House reception for Naropa Instructors, Spring 1987. Sue Secoff + translator at right hand.